If the thought of a sunny day or a starlit sky appeals as the backdrop to your wedding day then Egypt may well appeal as a destination. With many hotels offering innovative and very different styles of wedding package, your special day could be in an Arabian tent or in an ancient arena. There are hotels in Red Sea resorts as well as beside the Nile. There is Cleopatra’s Alexandria and the ancient sites at Aswan. What about Cairo, or a desert ceremony? Egypt is an exotic and adventurous backdrop to the perfect wedding celebration. If you get married in Egypt you can choose from some of the most evocative and unique destinations in the world. With the River Nile as a setting or a renowned arena, the country combines culture and romance in a magical way with thousands of years of heritage and tradition. Choose from an opulent tent draped in rich silks, or a simple ceremony under the stars. Sunshine is another reason for choosing Egypt as a wedding venue, as it is almost always guaranteed. Egypt is also a wonderful destination for a honeymoon following the wedding ceremony. Choose from scuba diving, cruising on the Nile or culture at the ancient sites. 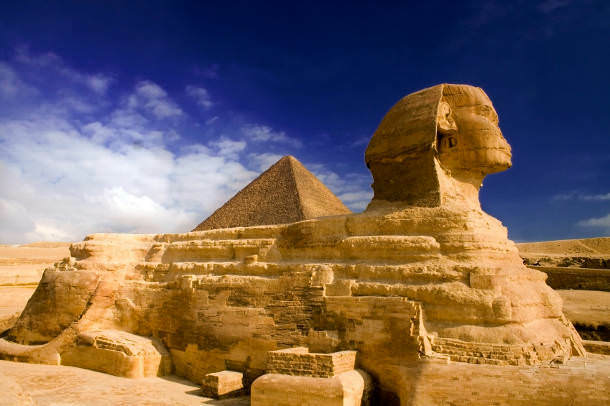 Egypt is renowned for hot and dry weather. Summers can be blisteringly hot, whilst winters are warmer and milder. Temperatures in the desert at night can get really cold. The best time to get married here is outside June to August to avoid the heat. March to May are good, as are September to December. This is a great place for a winter wedding. Avoiding Ramadan is important because people fast during the day and getting events organised in the daytime can sometimes be challenging. As in most Islamic countries, dressing respectfully, especially as a woman, is expected. The Red Sea Resort beaches are less conservative but shorts and swimwear away from a pool is not considered polite. Using the left hand is also offensive in Islamic cultures. In terms of weddings, Egyptians love to celebrate. Expect elaborate pre-wedding parties, and intricate henna designs on the bride’s hands. A pre-wedding hammam is another traditional treat. If you're a vegetarian Egypt will appeal as a wedding destination because the cuisine is largely vegetarian in nature and deliciously spiced. Koshari and ful medames are just two of the popular dishes here. Along the coastal regions such as Alexandria fish is commonly served. For meat lovers, grilled minced lamb kebabs and shawarma (pitta bread pockets filled with shredded beef, lamb or chicken) are also delicious. In Egypt US dollars and British pounds are acceptable ways of paying for services. Egyptian pounds can also be used. Credit cards can be used in major cities and resorts. In Egypt tipping is customary for services. If you are arranging a wedding package it is advisable to allow for this within the budget. Another option is to let the wedding facilitator fixing all the arrangements in Egypt to handle the tips with an arranged budget. The cost of living in Egypt is much cheaper than Europe and so your money may go further than you think. A wedding package in a 5 star hotel is around £4000-£5000 on average. In hotels the prices are fixed, but if you’re buying items and arranging things independently then haggling is part of daily business life here. The following notes are not comprehensive and are intended as a guide only. Before planning your wedding in Egypt we strongly advise you to contact the Egyptian embassy in your home country or your country's embassy in Egypt to obtain up-to-date legal requirements. Legal requirements for marrying in Egypt vary depending on which country you are from. We would therefore recommend that you contact the Egyptian embassy in your own country prior to planning your wedding to make sure that you have the most up-to-date legal requirements. Below is a rough guide. Non-Egyptian couples wishing to marry by civil ceremony in Egypt have to satisfy the Egyptian authorities that they are free to marry by providing documentary evidence of the termination of any former marriage(s). This normally involves visiting your embassy in Egypt and making statutory declarations before a consular officer, that you are free to marry. Documentary evidence of the termination of any former marriage(s). For example, divorce (decree absolute) certificates and change of name deed or, if appropriate the death certificate of a deceased spouse. Notary Public's Office at the Egyptian Ministry of Justice Annex. Many couples choose a civil marriage ceremony in their country of residence and then travel to Egypt for the wedding ceremony and celebration as this is less complex from a legal perspective. Gay Marriage and Civil Partnerships are not recognised in Egypt. Egypt is divided into 27 different governorates which are subdivided into regions. Each governorate has its own capital city and offers unique places for your destination wedding. Find out more about the Governorates of Egypt or browse our Egyptian Wedding Directory to start planning your dream wedding.